To some it’s a science, to others it’s an art. For us, it’s one of the most valuable marketing tactics out there. However, it has become harder than ever to stand out in the crowd. Today, email marketing is the most important tool to build your brand, grow your audience, and sales. It’s cheap almost to extent of being free and it brings in amazing results. But what happens when you get too carried away with it? Bang, your castle of the audience comes crashing down right at your feet! it’s that fragile, the whole art and science of email marketing. But our email marketing experts at CANZ have got your backs. 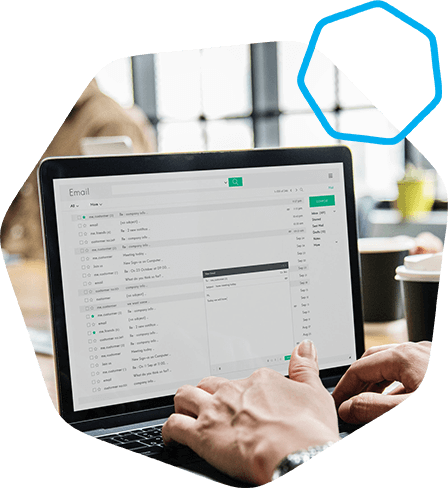 From the researching to planning the whole strategy for your email funnels, CANZ experts stay with you every step of the way to ensure getting to the right audience and hooking it for good (because we are THAT good). Without getting to an organic, opted in audiences, no direct marketing strategy can succeed. That’s our #1 rule for direct marketing. We NEVER work with 3rd party bought data. But you don’t have opted in data? No worries, we have a team of best lead-gen guys in the market all ready to build you a database of opted-in contacts. That’s exactly how you win any email marketing game. Where to get the priceless gems of email templates from? Like every other question you had about email marketing, our team of experts at CANZ has an answer to it. With our eye-catching email templates designed especially for each client after market research, you can always be sure you’ll hit just the right audience and that too with minimal effort at your part. Designing a subject line to creating a call to action that actually produces responses is our core competence. That apart from the insights we generate for you to know what’s going in and coming out of your business. so we examine analytics to see what produced results for you and at what cost so you know where to spend and where not to. Who doesn’t want someone looking out for them this way now? Our SEO services help you get higher rankings against top keywords, quality traffic and more results that are measurable. Don’t know how to navigate the unfriendly & complex Ads Manager? No problem. We do the heavy lifting for you. Our PPC experts decipher the Google Ads backend and optimize your PPC Campaigns and magnetize visitors to your website. Our conversion rate optimization service delivers measurable performance improvements to grow your conversion rates. Our complete package includes “digital 360” services and is ideal for medium and large sized businesses. and 31% respectively. Read the full case study below.